ROWING MACHINE 4-LEVEL HYDRAULIC RESISTANCE Our functional rowing machine offers a great opportunity for a total body workout. 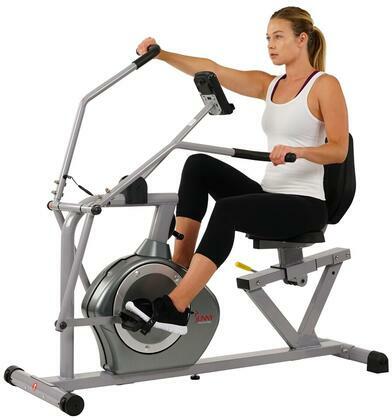 This compact rower is ideal for people who want to take their exercise in their home. It only needs a little space to set up, and then you can quickly start your routine. This unit provides an effective and low impact workout that increases strength in the major muscle groups, including the back, legs, arms, abdominals and buttocks. Designed with adjustable hydraulic cylinder resistance arms, and a manual resistance control knob, the trainer will meet different strength requirements. The LCD display provides you with all relevant information you may need, including time, speed, distance and calories. The thick, padded seat is very comfortable. The heavy duty steel frame makes it stable and durable. The nonskid rubber feet keep it from scratching the floor, and the rubber handle grips provide a comfortable grasp. FEATURES Colour: Black Dimensions: 106 x 75 x 20 cm (L x W x H) Max. height: 75 cm Frame material: Steel Net weight: 14.9 kg Max. user weight: 150 kg Computer functions: Scan, time, distance, speed, calories Nonskid rubber feet keep it from scratching the floor Easy to view LCD screen Fabric: Polyurethane: 100% PACKAGE CONTENTS 1 x Rowing Machine 4-Level Hydraulic Resistance Note: This order will be dispatched from our Sydney/ Melbourne Warehouse. This item may arrive in a separate delivery to the rest of your order. Usual dispatch time is 1-2 business days from order. This Shiatsu Leg Foot Massager will help to relief tension and fatigue of your feet with traditional shiatsu and reflexology therapy. Besides you can adjust the speed from low medium to high to massage your tiptoe arch of the foot sole of the foot according to your needs and likes. Enjoy your own spa experience at home with this amazing foot bath massager. This is our 1500 lbs hydraulic pressure transmission jack with which you can easily guide a transmission safely and securely. It is features fully adjustable saddle with corner brackets. Comes with foot operated pump and lowering pedal great lift range by telescopic two-stage hydraulic ram wide 4-leg base with swivel casters for stability and easy movement. It's ideal for any automotive or light truck transmission installation or removal. Maximum Saddle Height: 17 - 0.6875 in. Stroke: 4 - 0.5 in. Looking for a special tool to help install or remove the transmissions Look no further! Our brand new 2 stage hydraulic transmission jack is the perfect choice for you. Fully adjustable saddle with corner brackets and safety chains to secure the transmissions a rated capacity of 1100lbs and four heavy duty casters; it is the ultimate tool for installing or removing the transmission. Online Gym Shop CB18740 Outdoor Gazebo with Curtain Aluminum Weather-resistant Brown - 13 x 10 ft. This gazebo with curtains features a classic and elegant design. It will make the perfect sunshade shelter for outdoor events such as dinners BBQs family gatherings and so on. The roof made of 0.24 thick UV-resistant PC board guards you from the glare and harmful UV rays of direct sunlight. The canopy is solidly constructed from strong aluminum and is therefore extremely resistant to rust and very stable. This fully weather-resistant pavilion can be left outdoors all year around. The pavilion is delivered with 4 side walls equipped with zippers which can be drawn in bad weather. cloth hook and eye straps are also included for easy attachment of the curtains.